Brewery News: OR: Portland: Lompoc's "... Holiday Beer Extravaganza" returns Tuesday, December 2nd. PORTLAND, Ore. – Just as Santa has eight reindeer, so does Lompoc have eight different holiday beers, including one brewed for Hanukkah. The annual Lompoc Holiday Beer Extravaganza will celebrate the release of them all on Tuesday, Dec. 2 from 4pm to Midnight at the newly renovated Sidebar, Lompoc’s barrel tasting room at 3901 N Williams Ave. The holiday celebration will take place in the recently renovated Sidebar, which has added a roll up glass door to allow in more light, booth seating, expanded taps and an all-new menu of small plates designed for sharing. There will be complimentary appetizers featured at the event. All beers will also be available at the other Lompoc pubs on Dec. 2 as well, including Lompoc Tavern on NW 23rd Ave, Oaks Bottom Public House on SE Bybee Blvd, Hedge House on SE Division St, and Fifth Quadrant on N Failing and Williams. 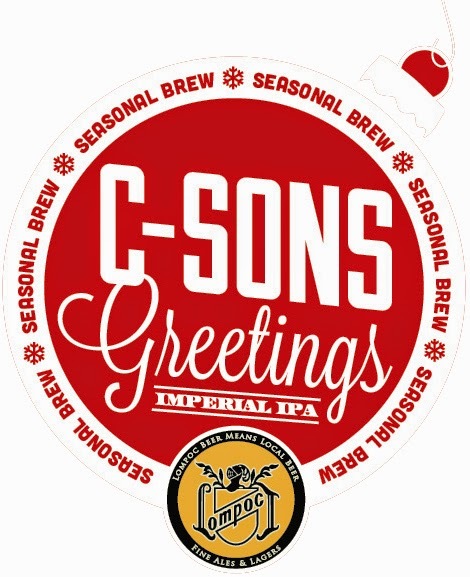 C-sons Greetings and Bourbon Barrel Aged Old Tavern Rat are also available in 22 ounce bottles, at a cost of $5 and $12, respectively. Lompoc Brewing annually releases a large number of holiday beers, a testament to its seasonal brewing and barrel aging programs. For more information, call 503-288-3996 or visit www.lompocbrewing.com.